Data acquisition, for those unfamiliar with the term, is simply the process of collecting data on some physical process, and passing this data to a computer for analysis. Though most commonly used in industrial processes and scientific applications, there are many reasons why using systems like this can be useful for race cars. First and foremost, implementing data acquisition systems in race cars provides a vast amount of data that can be invaluable in squeezing every last bit of performance from the vehicle. Formula One teams, for instance, employ dozens of people to analyze the torrents of data produced by their cars, in order to find out precisely where performance can be improved. Before I take you through some of the other reasons to use data acquisition systems in race cars, it is worth noting that these systems are something quite different to telemetry. If you are involved with race cars in any way, it is likely that you are already used to using telemetry, and understand the key concepts of this. Data acquisition is something different – whilst telemetry is typically used to improve performance during races or practice sessions, data acquisition produces data to be analyzed at a later date. Most commonly, it is used to improve mechanical performance of the race car itself, rather than that of the driver. So what purposes can data acquisition be put to in a racing context? Using Data Acquisition systems in race cars produces vast amounts of data that, when looked at in conjunction with telemetry, can be used to improve race performance. Collecting even the minimum level of data on in-race performance, such as RPM and engine temperature, can give valuable insights into where performance gains can be made. Using data collected over longer periods can also be extremely useful in finding weak points in the reliability of vehicles. In fact, finding design weaknesses is almost impossible without collecting some form of data on how the vehicle was working during break downs. In addition, using data acquisition on race cars can reveal potential failures before they happen. It might be the case, for instance, that tyre pressures are continually running near their design maxima, and that therefore tire failures are much more likely. Using data acquisition can reveal this before a catastrophic failure. Using data acquisition techniques on race cars, it is possible to safely push vehicles closer to their limits. Analysis of data may reveal that certain components in the vehicle are capable of greater performance than is currently being wrung out of them, and that there is room to push them further. In addition, analysis of this data can help drivers, by pointing out where they can push the vehicle further. Especially with unfamiliar vehicles, many drivers err on the side of caution, as they are unsure of the limits of the vehicle they are driving. 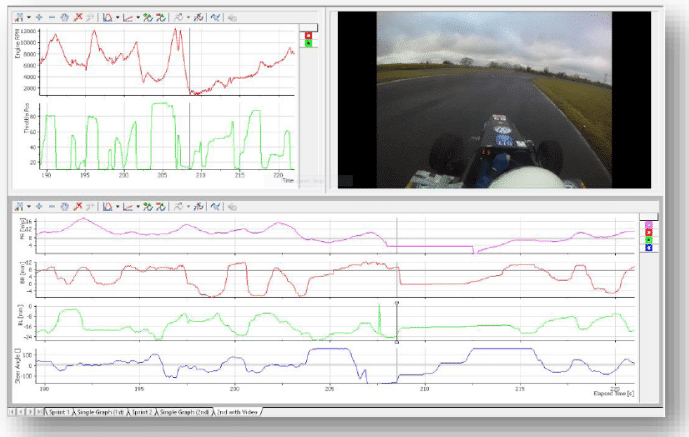 Data acquisition for race cars can help them understand where these limits actually lie. To learn more about DAQ products click here.